Twelve miles off the coast of Maryland’s Eastern Shore, Tim Marshall and I knife through the salty, choppy waters of the Chesapeake Bay in an aging white fishing skiff. It’s a clear, bright August morning, and Marshall, slugging cans of Diet Coke, steers us straight for the approximately 4,500 acres of tidal marsh that make up the federal Martin National Wildlife Refuge. To our backs is Smith Island, the last inhabited offshore island on the Maryland side of the Chesapeake. Marshall pilots us to the outer banks of the wildlife refuge, where the horizon is nothing but the blue waters of the Chesapeake and a faint speck in the distance—the remains of Holland Island, whose 360 residents fled rising waters and eroding soil in 1922, and which serves as a constant reminder to the people living on Smith Island that they might be frogs in a pot of slowly boiling water. 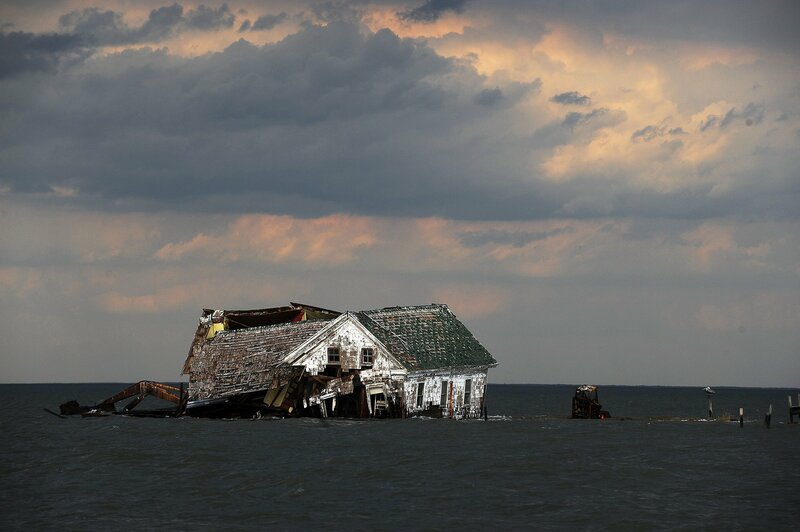 Smith Island too is disappearing, its land eroding as it submerges into the Chesapeake. Even if the Chesapeake can be kept at bay, there’s no guarantee islanders will stay: In the past 15 years, a growing number have moved out, seeking better opportunities on the mainland. The question today is what will vanish first—the island or its people? Inaccessible by car, Smith Island is reached by a 45-minute boat ride from Crisfield, Maryland, to the east. Bridges and gravel roads connect the villages of Ewell and Rhodes Point, but the only way to get to Tylerton is on a boat. Smith Island is quaint: There are no chain stores, ATMs or police stations, and mail and supplies arrive daily by boat. Residents drive vehicles brought over by barge, while visitors usually navigate by golf cart or bicycle. A one-room school building accommodates children until they are ready to travel on ferries to the mainland for high school. The Smith Island Baking Company, responsible for Maryland’s official dessert, Smith Island cake, is in Ewell. Most of the men who live on the island make their living on the water, crabbing between April and September, then fishing for oysters the rest of the year. In some ways, the island hasn’t changed much since it was first inhabited by English settlers in the late 1600s. Today, just 276 people live on Smith Island. There are efforts to raise that number, but it’s hard to bring new residents to a place that, as Chesapeake Climate Action Network Executive Director Mike Tidwell wrote in The Baltimore Sun in 2009, “will almost certainly disappear even faster than the Maldives and faster than several much-publicized South Pacific island nations.” Global warming appears to be the bandit that can’t be stopped. The melting glaciers and loss of ice from Greenland ice sheets have contributed to the rapid sea-level rise in the Chesapeake. The Army Corps of Engineers estimates that some 3,300 acres of Smith Island land have eroded over the last 150 years. Currently, only 900 acres of the island chain are habitable.